Pioneer Electronics (USA) Inc.’s second generation Networked Entertainment eXperience (NEX) in-dash multimedia receivers introduced at the 2015 Consumer Electronics Show are now available at authorized Pioneer retailers across the country. The 2015 NEX line includes the AVIC-8100NEX, AVIC-7100NEX and AVH-4100NEX, the first products to offer consumers both Android™ Auto and Apple CarPlay™ connectivity to provide maximum smartphone connectivity flexibility. Two additional models, the AVIC-6100NEX and AVIC-5100NEX, offer only Apple CarPlay compatibility. The NEX line of products also feature advanced Bluetooth®1 capabilities, AppRadio® Mode, MirrorLink® compatibility, iDatalink® Maestro™ support and enhanced audio/video capabilities including Pandora® internet radio, SiriusXM-Ready™, and FLAC file playback. Three of the five NEX models feature Android Auto integration, allowing consumers to quickly connect their compatible smartphones to extend the Android platform into the car in a way that’s purpose-built for driving. Designed with safety in mind, Android Auto utilizes a simple and intuitive interface to provide navigation, communications, music and more, combined with powerful new voice actions for minimized distraction, so users stay focused on the road. Smartphones running Android 5.0 (Lollipop) or newer operating system offer Android Auto and will work with the three Pioneer models. The first time a user connects a compatible smartphone to the receiver, the user will be prompted to download applications required for Android Auto. For more information about Android Auto functionality on Pioneer’s three NEX models, visit www.pioneer-carglobal.com/AndroidAuto. Pioneer’s Apple CarPlay-compatible NEX in-dash receivers offer consumers the ability to upgrade the vehicles they already own to the smarter, safer and more fun way to use iPhone® in the car. Consumers with the latest version of iOS on their iPhone 5 or newer, including iPhone 6 Plus and iPhone 6, can use Siri® voice control to make and receive calls, compose and respond to text messages, access Apple Maps for navigation, and listen to their music, podcasts, or iTunes Radio. 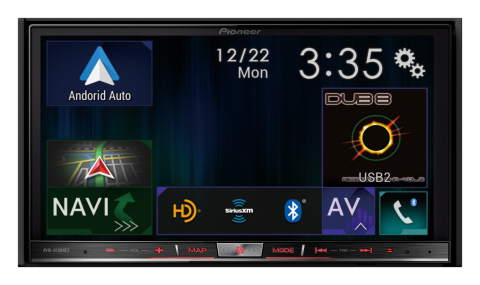 Pioneer’s AppRadio Mode provides both iPhone and Android users the ability to access and control dozens of popular in-vehicle apps directly from the receiver’s large touchscreen display when connected to an iPhone 5 or newer, including iPhone 6 Plus and iPhone 6, or compatible Android smartphone using the corresponding interface cable2 (sold separately).